You may make your decisions based on personal preferences, however, remember that in 1942 a committee was formed to set out guidelines for the proper performance of our nation’s anthem. Those guidelines can be found here, and were also given to students as a handout. The first round of listening was done in class, with the students voting as a group on who advanced to the next round. The Semi-Finals and Final match up are to be completed by students for homework. Share the post "Star Spangled Sing Off"
And we’re off! After a slow start last week (I was sick and missed seeing a ton of private students), this week I start the school year in full! I’ll be visiting all my friends at ACS, PACS Primary and PACS Upper, not to mention all my private students too! I can’t wait to see you all! Share the post "September 2017"
Four Christmas Concerts, two Spring Concerts, one Show Choir/Glee Club/Chimes show, one dance performance at a Devils Game, countless church appearances, one graduation, and two Spring Recitals later… and the 2016-2017 school year is finally complete. I’m in the middle of two weeks of a little bit of relaxation before I head upstate for my summer gig. This has been an exciting school year for me, and I hope to only build on all the hard work I and my students have done when I come back to the 2017-2018 school year. Onward and ever upward, amiright??? As you know, I am a general music teacher at both ACS and PACS in Perth Amboy. What you may not know, is that I am also a private piano/guitar/voice instructor that teaches one on one and group lessons in Central Jersey. If you are interested in lessons, I am now making a list of students to book for the fall. If you are interested, please sign up and I’ll be in touch with you over the summer! Share the post "And that’s a wrap!" Happy Father’s Day to all the amazing dads out there and dad-like people doing what they can to raise the next generation of amazing humans. This song is dedicated not just to dads but to all the inspiring men out there in our lives. While singing this song with my students I’ve thought not just of my own father, but of dance teachers, and college professors who have gone above and beyond to help shape me into the woman and teacher I am today. I hope you all have an awesome day! PS – if you’re here, I hope it’s because a student of mine is about to serenade you (or maybe you’re one of my students who wants to practice)! If not, please don’t spoil the surprise! Don’t click on the youtube video below until Father’s Day! Share the post "Happy Father’s Day!" Happy Mother’s Day to all the amazing mothers out there and mom-like people doing what they can to raise the next generation of amazing humans. This song is dedicated not just to moms but to all the inspiring females out there in our lives. While singing this song with my students I’ve thought not just of my own mother, but of piano teachers, dance teachers, and college professors who have gone above and beyond to help shape me into the woman and teacher I am today. I hope you all have an awesome day! PS – if you’re here, I hope it’s because a student of mine is about to serenade you (or maybe you’re one of my students who wants to practice)! If not, please don’t spoil the surprise! Don’t click on the youtube video below until Mother’s Day! Share the post "Happy Mother’s Day!" The “quote” which is the title to this blog post (and variations of it) can be attributed to a few people – from Mozart to Debussy to Miles Davis. I could probably write a whole ‘nuther blog post just on this quote alone (and Davis’ variation: “Don’t play what’s there, play what’s not there.” Ah, that inspires me to jump up and run to my piano right now! ), but that blog post is not for today. No, actually, this blog post is in reference to an article I read on, of all places, Entrepreneur.com. You can find it here: The Best Way to Use Breaks to be More Productive. To summarize, breaks are important. The article goes on to discuss the balance between how long you work and how much break time to take, and how best to spend a 5, 10, 15 or even 30 minute break at the office. It’s a really interesting article that you might want to read because you are an adult in my life, but what really strikes me is how this relates to being a musician, and also, how it relates to being a growing musician, like all of the kids I see each week. Practicing is something that I spend a lot of time talking to my students about. It’s not just my job to teach your children music, but to teach them the skills to sustain a lifelong love of music – and that includes being able to practice it regularly without the adults in their lives nagging at them about it. Really – if I teach your child, go on and check out their manuscript book (I’ll wait). In the last month or two, I’ve probably written not just praise on their improvements, but often general and sometimes incredibly specific strategies for how to practice a piece of music. What I don’t really touch on in writing (though I guess it’s there if you read between the lines) is the importance of breaks. For most of my students, we discuss the importance of a regular practice habit, how many times a week, how many minutes each time. The general rule for most of my students is somewhere from 4-5 days a week (why not 7? because I’m a realist and know that your child also has homework, projects, and a social life, not to mention the possibility of activities like sports and dance. It’s not my job to set unrealistic and unattainable goals for your kids. I want them to succeed, after all, and not feel like they are constantly playing catch up. Anyway). But for any of my older students who can sit for more than 20 minutes at a time, breaks can be incredibly important. Or maybe, giving students a break can help to inspire them to sit for longer than those 20 minutes. Twenty multiplied by 2 is 40, and if my kids could practice for 40 minutes 4 times a week instead of 20, well, I don’t need to tell you how great that would be. At entrepreneur.com, the five minute breaks include preparing a snack, reading an article, giving yourself a hand or neck massage, and trying to solve a Rubrik’s cube. You can read about the benefits of each in the infographic at the page (plus all the other kinds of breaks you can take), but I think these are the ones that work best for practicing musicians (of all ages), and take the least amount of adapting for younger players. Prepare a snack. This one is specifically for you parents. You’re the grocery buyers in the house, and you know what your kids like. Berries, leafy greens and nuts can boost brain function (Apples and cheese are great, too!). Sounds like a PB&J break might be just the thing to break up a practice session, or break it down with fresh berries and raw shelled nuts. I happen to love cashews and pecans, and I’ve almost always got raspberries on hand, so I know what I’ll be reaching for when I go to practice later on. Reading an article. Your kids might not be avid online readers with their own feedly.com account, but if they do love to read (and I do, too!) let them pick up their latest favorite book to read a few pages or a whole chapter. Hand or neck massage. At this point, our kiddos are not really at the place in their musical development where stretching before, during or after practice is really necessary (though if they’re ever playing for 30 minutes or more non-stop it’ll be something we’ll talk about, especially if they stay serious about music in college), but something as simple as getting up for a bathroom break, getting a drink of water, or just stepping away from the piano for a few minutes is a good hand, body and brain break. The Rubiks cube. I know a kid who can solve this in under two minutes, or something really ridiculous like that. You can also find videos of Rubiks cube genuises on youtube. Your child doesn’t need to be the next Rubiks prodigy, but a simple brain teaser or puzzle is a good way to stay focused and yet take a break all at the same time. When I was in college, I definitely spent a lot of time in the practice room. I also spent a lot of time wandering around outside the practice room, too, and I think both of these activities were equally important. When I took my breaks from practicing, it was to do a lot of things that I mention here – bathroom/water breaks, snack breaks. Sometimes, yes, socializing breaks. It’s impressive to say you spent two hours practicing a day, but if you spent an hour of that time spacing out or constantly repeating passages without making progress, you haven’t really accomplished much. The time away from the instrument, when handled correctly, can become just as important as the time you spend looking at and playing music. Another great article at entreprenuer.com covers how to spend a lunch break. With a little creativity, you can adapt these ideas into habits for yourself and your kids, too! What are some of your non-musical practice tips? What is your favorite way to take a break from the music? Leave a comment below! Share the post "It’s the silence between the notes that makes the music"
MAMTG Spring Festival 2017 is fast approaching! The Mid Atlantic Music Teachers Guild Spring Festival is fast approaching! Here’s what you need to know if we haven’t already had this discussion! The deadline to register is February 1, 2017. That means all registration forms and associated fees need to be handed back to me no later than January 25. Everything will be mailed out in one big packet by me. Students are invited to participate in Standard Competitions (on either piano, voice or guitar), which is where all students in a given category perform the same piece and are scored based on their performance. Students may also participate in Evaluations, which can be a really helpful learning experience for students. Students perform a piece of their choosing (though I always suggest using the Standard piece appropriate to their level, even if they are not competing in a Standard category) for a judge who then gives them feedback – both praise and critiques. Top scoring students in competitions have a chance to earn a trophy or medal. All students who participate in evaluations earn a trophy. For my more advanced piano students, there is a Sight Reading competition to try out, which is MOST exciting and a true test of musicianship. For older students who can sing and accompany themselves on an instrument – either guitar or piano, there is the Talent Showcase. Even if a student is interested but not ready to enter that competition, it is a great and inspiring event to watch on Saturday night. If a student is very new – if this is their first time participating in the competition – I always suggest doing just an evaluation first. If they are more adventurous or this is not their first time, I suggest students participate in both competition and evaluation. Of course, you are free to participate how you see fit. The competition is the weekend of April 1. Most events my students would be participating in take place on the Saturday of that weekend, while the awards ceremony, which students are welcome to attend, takes place on Sunday afternoon. The festival happens at the Hanover Marriot on Route 10 East. In addition to the categories your child participates in, there are many other competitions to watch, competitions for different instruments, competitions focusing on different styles of music, higher level competitions that take place on Friday and Saturday night, and even an ensemble showcase that was a ton of fun to watch last year (and I expect more of the same this year!). The festival always hosts a vendor selling cool music gifts for your budding musicians, everything from the cute – like socks and suspenders – to the very nice – like jewelry. The hotel features a great breakfast, a cool Irish pub (with authentic decor and great food), an indoor pool and an outdoor walking trail. If you are a family with siblings who will be participating in the competition, and even if you’re not, you may want to check out MAMTG’s packages page – where you can register for a hotel room PLUS get a discount on your festival registration. Additionally, if you’ve got a teenaged student (or an older sibling to a student) who could log some community service hours working at the competition, we can always use the help! Specifically, we are looking for students who are 16 or older who can work as room captains or assistant room captains throughout the weekend. A room captain takes attendance, fields questions, keeps the flow of each competition running smoothly, assists the judge if they need it, and communicates with festival staff (like myself) if a problem arises. It’s a pretty important, yet actually pretty easy job, and it always seems like we can use an extra pair of hands on deck with something. I wouldn’t expect a teenager to volunteer all weekend long, but if they did, they’d be able to log almost 20 hours total from Friday night to Sunday afternoon, so if they are looking to pick up volunteer hours and also have an interest in music, this would be an excellent opportunity for them. If you have a student or their sibling who is interested in volunteering, or if you yourself as a parent can give a few hours of your time that weekend, please let me know. How does one register for the festival? I’ll have registration forms for parents to fill out starting this week which need to be filled out and returned with payment by January 25. Payment can be sent in either cash or check to me (make checks out to Miss Anna Lawrence, as I will be sending them one big check instead of sending along 985438723754957366 little checks). The MAMTG Spring Festival is an amazing event that I really hope you and your child will attend. It’s fun and exciting to prepare for a competition, a thrill to participate, and a ton of fun afterwards (once the pressure is off) to do some shopping, see some other competitions, or just hang out at the beautiful (if somewhat noisy) hotel. I hope to see you there! And of course, if you need more information, please check out the MAMTG website. Share the post "MAMTG Spring Festival 2017 is fast approaching!" 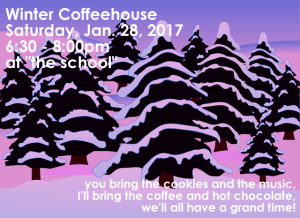 You’re invited to a Winter Coffeehouse! 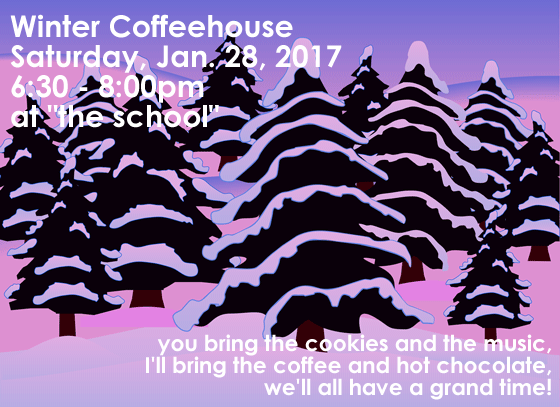 I’m pleased to announce on Saturday January 28, I will be hosting what I hope will become my first annual Winter Coffeehouse. It will be a chance for the students to come together, hang out, and perform for each other in a relaxed setting. The only way to become more comfortable performing is to practice it as often as you can, and what better way to do it than with friends? The Coffeehouse will take place at “the school” where I teach on Saturdays. Don’t know where that is? Once you RSVP yes, I will let you know! Any student who has been playing for more than a year is invited to prepare one song to perform. Been playing for more than a year but don’t want to perform? No pressure! Have only been playing a few months and you want to give it a try? Be my guest! The most important thing is to have fun. If you would rather read or recite a poem, that is fine, too! I will have books for you to choose a poem from. Finally, if a student wants to come just to be a supportive audience member that is fine, too (but maybe, parents, bring their music just in case they change their mind!). While I encourage all students to perform, forcing them before they feel comfortable to do so is a recipe for a bad experience – and who wants that?! For refreshments, I ask that all families bring 1-2 dozen cookies or another kind of small treat. Home baked or store bought is fine. I will prepare the space and provide coffee and hot chocolate. You are free to chat in the room where the refreshments will be set up (not super loud though! ), but the performance space will be in a quiet room out of respect for the players – only whispers or no talking at all! Parents are welcome to stay and observe the performance, chat with other parents, or drop your children off (as long as you are back to pick them up at 8!). There will be enough parental supervision plus I will have a few of my older students on hand to keep an eye on the kids. Finally, our snow date is the following Saturday, February 4, 6:30 – 8:00, so keep that date open just in case! Share the post "Winter Coffeehouse"
Choir Season is Starting Soon! Choir season is starting soon and I am so excited! Auditions at PACS began today and will hopefully wrap up tomorrow. Auditions at ACS will begin next week. By the end of the month, I will be in full swing with both of my after school groups. While I do a lot of singing with the students at both of my schools, I am really excited every year to sing with kids in Chapel Choir (PACS) and Show Choir (ACS). Both groups are a way for me to connect with students who want to take the next step with singing. Before we start working on our repertoire (music for Christmas or Spring concerts), we take a few minutes to warm up our voices and talk about and practice technique – pronunciation, listening skills and breathe support. Yes, we have to practice breathing! Singing can sometimes be like running a marathon and so every aspect needs to be discussed and practiced. Before we get to our rehearsals, though, everyone must audition. Auditioning is an important step in the process and an important thing to practice. Just like how a student can know a lot about one subject but then freeze when it comes time to take a test, a student can have a great voice but their nerves can work against them in an audition. This is one of the reasons why even returning students must audition for me each year. Being comfortable with the audition process will get them far should they choose to participate in music programs in high school and college. Another reason to audition is it gives me a way to check in with each student, especially the older boys and girls. Everyone knows that a boy’s voice changes as he grows older, but girls voices change as well. Checking in with everyone at the beginning of each year helps me to assess their voices to see if they should be singing lower or higher parts when it becomes time to split the group into different voice parts. Every child has a beautiful voice, even those with uncharacteristic boy or girl voices (some of the most beautiful high solos are sung by boys; some of my favorite female singers have deep and rich voices). Knowing what kind of voice a student possesses beforehand helps me to bring out the best in each of them. Finally, after I decide who makes the cut (I unfortunately just cannot accept all the students that audition each year), students will receive a permission slip for their parents to sign. This lets me know that the parent knows their child will be staying after school (Thursdays for ACS until 3:50, Fridays for PACS until 3:15). This also informs parents of my requirements for their children – students must be well behaved or they will be asked to leave Choir, students must also maintain a music grade of B or better through the school year. All students should, of course, be getting all As in music so this should be a pretty easy requirement for all to fill. Once we audition, and I get back all my signed permission slips (SUPER IMPORTANT STEP! ), figure out voice parts, decide on a seating chart, and get into rehearsals (Oct. 14 for PACS, Oct. 20 for ACS), it’s right onto music for Christmas performances! In addition to each schools’ Christmas Programs in December, I am working on one more performance each for both groups. These performances will be outside of school hours so parents should please watch out for the permission slips coming home. Students will not be allowed to perform without a signed permission slip! After our Christmas performances, it will be on to the Spring Concerts. At PACS I do not have a theme picked out yet, but the ACS Show Choir theme is “Faith in Musicals” – I will be choosing selections from Godspell, The Sound of Music, Fiddler on the Roof and other classic musicals that also happen to have a strong religious theme. I am already excited for this show, and I hope the students will be, too! We will be doing a little bit of fundraising throughout the year in the hopes of raising enough money to bring back the band from last year’s performance – the kids were great singers but I know the band was a big hit, too! I’ve also got a very unique opportunity I hope to share with both groups this spring. As a private music instructor, I belong to the Mid-Adlantic Music Teachers Guild. Each year we host a huge competition in Whippany, NJ. There is no choir competition category *yet* but there is an Ensemble Showcase event where students get to perform and will also be critiqued by a panel of music professionals. Every chance to perform is a learning experience, but this one is especially so, and the environment is always so supportive and exciting! I will need 100% participation from the students in each group, and it will require a high level of dedication to make sure we are prepared to perform. The event is held the weekend of April 1, 2017, and information can be found at mamtg.org. As always, I look forward to any feedback, questions, and comments from my choir parents. With their support, and their awesome children, I look forward to accomplishing quite a lot of musical awesomeness this year! Share the post "Choir Season is Starting Soon!" Yep! Group classes are here! 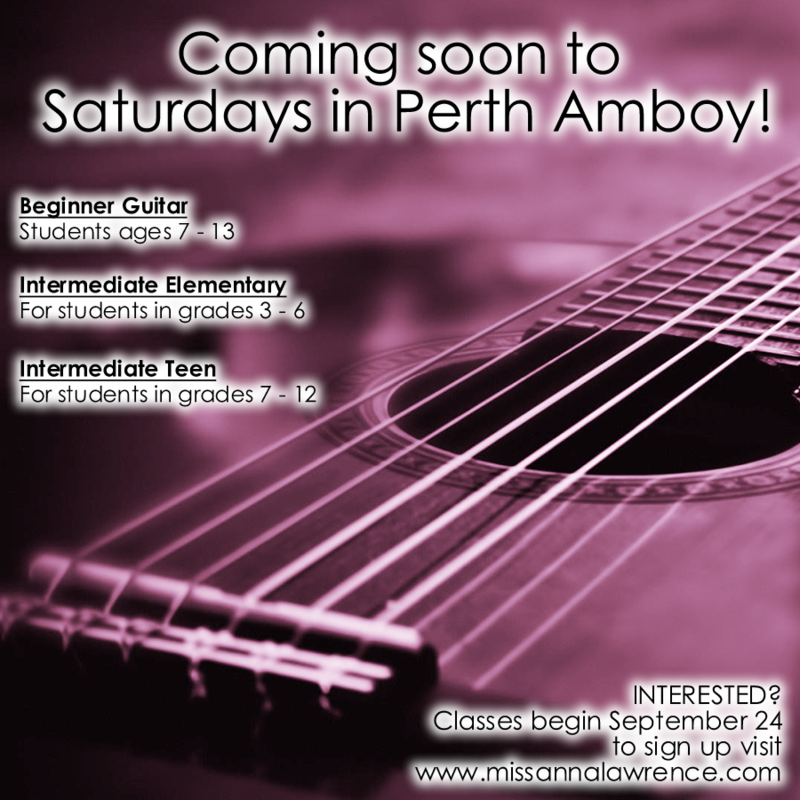 Guitar classes begin in just a few short weeks right in beautiful Perth Amboy, NJ. The day begins with the Beginner class at 11:45 and the Intermediate Teens will be wrapping up at 2:00. For more details on the schedule, head over to the Group Classes page. Be sure to sign up with your info at the bottom of that page if you’d like to attend! Share the post "Group Classes!"